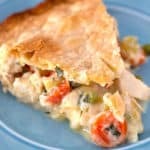 Chicken pot pie is one of my favorite comfort food dishes! 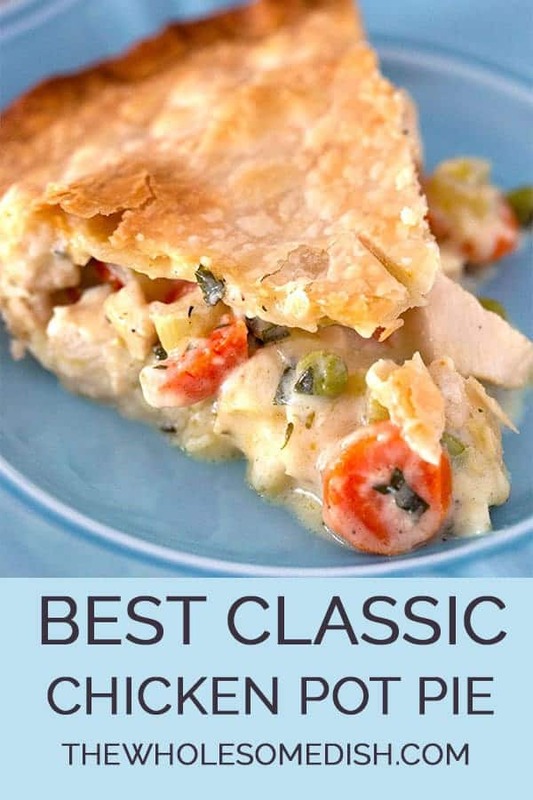 A true classic with the most deliciously flaky crust! Definitely one the whole family enjoyed! 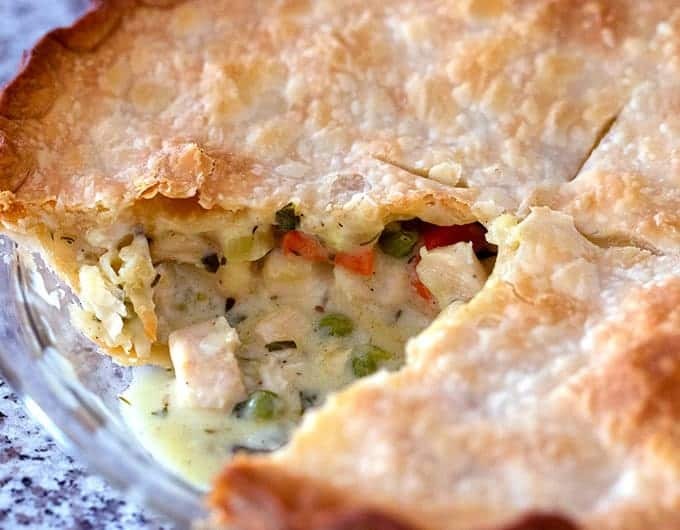 Chicken pot pie is the ultimate comfort food. This is one of my favorite recipes!! SOOOO good! Wonderful recipe. Tasted absolutely amazing. Absolutely delicious comfort food! Highly recommend the recipe. Cannot begin to be in any way a comparison to the prepared ones in frozen food section… and easy to make after you’ve done it a few times. 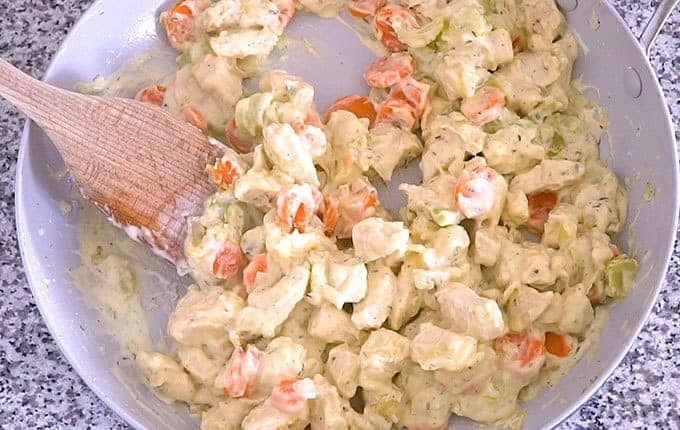 This is a very good recipe for an old time favorite..its a keeper! Used cubed boneless, skinless chicken thighs. Added cubed potato & substituted fat free half & half for the heavy cream. Yummy! Thank you for a wonderful recipe! Excellent. I used a puff pastry sheet on top because it was easier for me today. The mixture was so good. Thank you for sharing this recipe with us. When you used the puff pastry, was the oven temp and cook time different? I’d love to try! Definitely a keeper! Very Delicious, whole family really enjoyed it. Can’t wait to make it for a pot luck dinner to share with everyone. Made this tonight. So so good. I’m not a big fan of pot pies but sure did eat a lot of this. It was so good. So easy. My favorite so far!! Can I freeze this uncooked? Has anyone used turkey? This recipe may not be *the*easiest, but it was still quite easy and oh so delicious! I made it according to the instructions exactly, and got rave reviews from my husband, kids and parents! Made this with the leftover dark meat from our Thanksgiving turkey. Was very delicious! The thyme is a nice addition to the sauce. I will definitely use this recipe again. Knocked it out of the park. Many thanks. We added fresh herbs (basil, parsley, thyme) from the garden, a little turmeric and a handful of shitake mushroooms. None of our puppies wanted to leave the kitchen when the aromas hit . . . 🙂 Headed over to enjoy this with our 104 years young grandmother. Paired with an arugula, pecan, apple salad . . . raw honey, balsamic, olive oil dressing. Yes!!!!!!!!!!!! 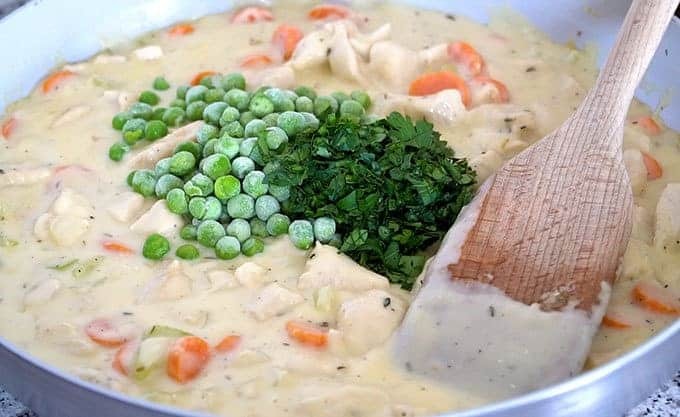 My husband and son love this recipe!! Thanks!! I made this last night and it was DELICIOUS! My husband basically finished the whole thing and raved about every bite he took! 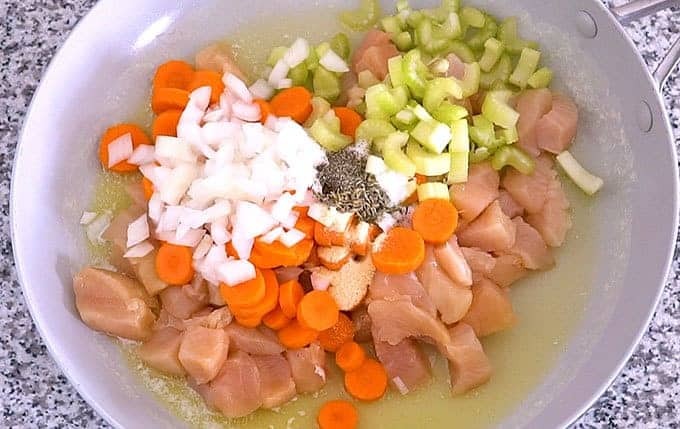 This is my first recipe from your site – I am excited to try more! Thanks for the great dinner! I’m not a big fan of chicken pot pie but my daughter is. Tried this recipe tonight and it is an instant favorite for both of us! And it’s easy! Thank you! 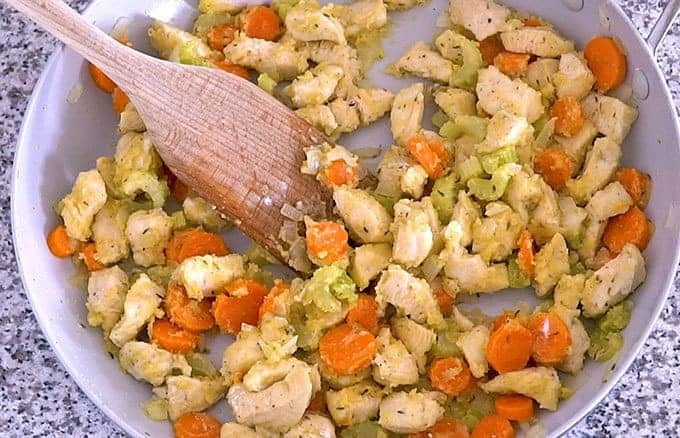 I hate when people rate a recipe based on their mods but unfortunately, I could make this to a T as the hubby hates celery. 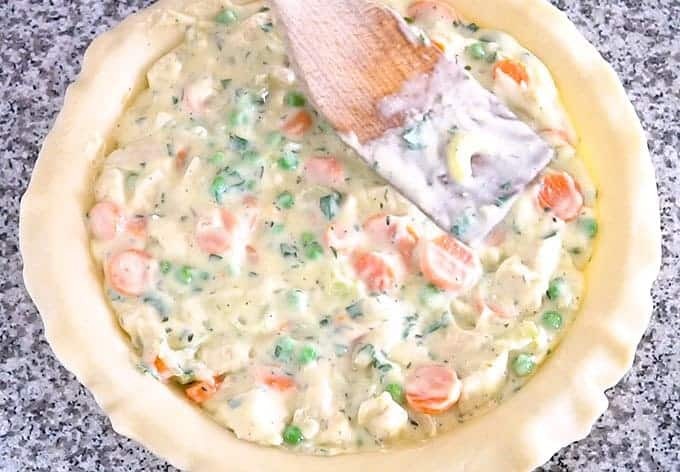 Instead, I added a whole russet potato (reduces the carrots to 2/3 c simply to balance out the sheer volume of veggies and make sure it would all fit in my pie plate). Other than that, I made this exactly as written and it had a pretty darn good taste. However, I thought I’d share that my modifications threw the consistency off. Without celery (which is primarily made of water and would help keep the gravy from getting too thick) and adding potatoes (which increases the starch content), my filling was prettyyyyy thick. Too much if you ask me (hubby on the other hand was raving about how great it was). So in my opinion, if you’re one of the many who like potatoes in your pot pie, keep in mind that they’ll naturally thicken your gravy and you’ll need to reduce the amount of flour to compensate. In addition, despite cooking for enough time after adding my flour, I still tasted a bit of raw flour in the final product. Next time I’ll probably just remove everything from my pan to make a quick roux and combine everything back together before cooling my filling next time. With all that content it’s nearly impossible to make sure all of the flour is in contact with the pan long enough to cook that taste off. Obviously my sauce consistency issue is no reflection of the recipe as it’s written since I had to modify, so my rating reflects the overall taste and processes alone. I made this with a couple of modifications because of allergies. I subbed evaporated coconut milk for heavy cream. Gluten free crust, and potatoes for peas. I’m allergic to peas. It was great. Thank you for the recipe. This was such a good recipe! 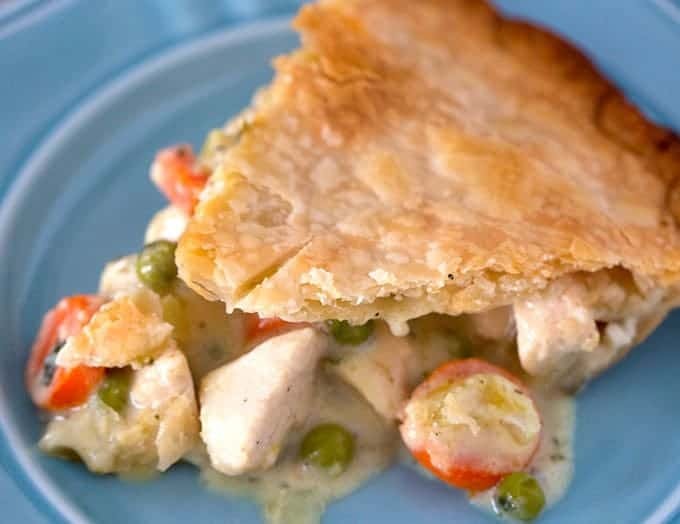 I was bummed because I had misplaced my go-to recipe for chicken pot pie. I’m so glad I found this one, because it is better than my original recipe! 🙂 I just added diced potatoes to mine and it was perfect for our family! Thanks so much! I am making this tonight and will veganize it! The only thing I see wrong is that you say the crust is flaky but there is no recipe for it. 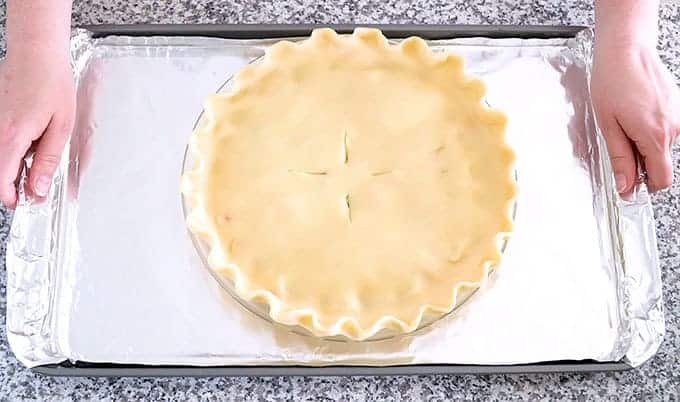 🙁 Its ok because I am a super pie crust maker but it would have been nice to see what you do with yours to pair it with this particular pie. I’ll let you know how the vegan version comes out! looking forward to this one! Ok, I made this vegan. I used Chickenish for the broth, tempeh for the chicken, vegan butter for the butter, cashew milk, and made a vegan crust. I also added some diced potatoes. I love the way this turned out. My husband loved it and that is saying something. Thanks for the recipe. This recipe is perfect. Thrilled with how it turned out. Delicious! Plan to make it again! Made this last night, AWESOME!!! I made this over the weekend and it was delicious. I did add 1 cup diced Russet potato, and only 1/4 cup onion. Did not change anything else and it turned out great! Can’t wait to make it again.